TOUCHSCREEN MONITOR WHEEL BALANCER WITH TOUCHLESS WHEEL DIMENSION DETECTION. FAST, ACCURATE, RELIABLE AND EASY-TO-USE. 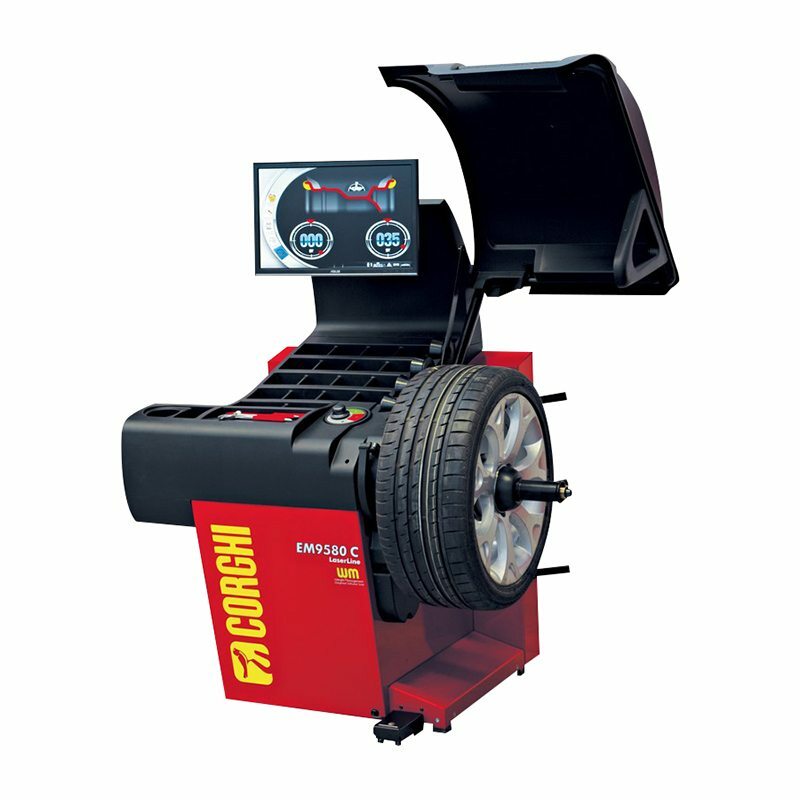 Touchless wheel balancer, with touchscreen monitor, for passenger cars, light weight trucks and motorbikes. Space-saving wheel casing (patented). Designed to allow posi-tioning of the wheel balancer against the wall and to accommodate wheels with diameter of up to 44” (1118 mm). New electromagnetically system which reduces working times and increases centering precision. New electromechanical system which reduces working times and increases centring precision. Measures dimensions with touchless system. High precision laser sensors automatically measure all wheel dimen-sions in a few seconds during the measurement cycle. At the end of the spin the wheel is braked and automatically brought to the balancing position. The integrated led light illuminates the work area to facilitate rim cleaning and ap-plication of the counterweights. The internal point laser indicates, with maximum precision, the position of application of adhesive counter-weights. High-precision measurement of radial and lateral wheel run-out (1st harmonic and peak-to-peak) and calculation of the best coupling of parts, resolving the typical problems of road vibration. The graphical interface and touchscreen technology simplify and speed up operations and work programme selection. Special programme collection including less weight which saves time and counterweights, increasing the econo-mic benefits and safeguarding the environmental. Speeds up selection of the va-rious work programmes. Ergonomic and functional, with large trays for the dif-ferent types of counterweights and tool positioning. Designed to allow posi-tioning of the wheel balancer against the wall and to accommodate wheels with diameter of up to 44” (1118 mm). Inclined front part to improve operator access to the inside of the rim. With slots for additional accessories. Standard accessories pliers, width gauge, calibration slugs and wheel centring and locking kit 42-118,5 mm.